Sunday, 8:40pm CT—As darkness descends upon Houston, another very wet night has already begun for the region. So far this evening, the heaviest rains have fallen across the western part of the region, including the Katy area. As much as 6.5 inches of rain have fallen near Cinco Ranch from 5pm to 8pm. A flash flood emergency is continuing for pretty much the entire Houston area tonight. These rains have occurred near, and over the massive Addicks and Barker reservoirs on the west side of the city. Earlier today, the US Army Corps of Engineers said it would have to make controlled releases into Buffalo Bayou (which already is beyond flood stage) in order to prevent a more catastrophic release later next week. “This flood event will exceed the 2016 Tax Day Flood elevations,” said Col. Lars Zetterstrom, Galveston District commander. It seems probable that some homes near Clay Road and Eldridge, and in the vicinity of the Westpark Toll Road and Highway 99 will see water remain in homes for up to two months. That is not a misprint. The radar at about 8:30 p.m. shows where conditions are likely to be most extreme tonight, at least during the pre-midnight hours. There isn’t much good news at this point. 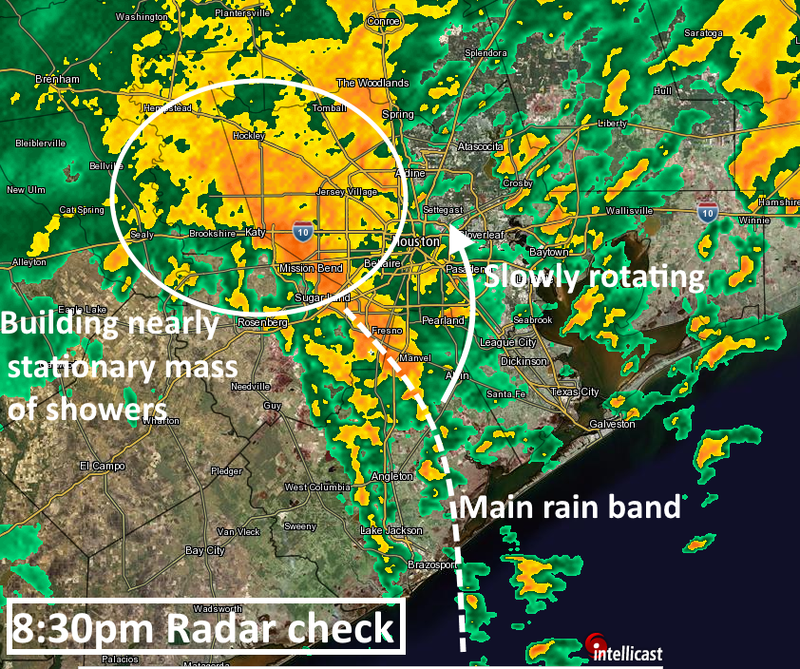 So far, I guess, we can be happy that the southeastern part of the metro area, including Friendswood, League City, and Clear Lake, have received a bit of a reprieve this afternoon. They were hardest hit Saturday night. But it seems likely the main rain band will at least clip those regions during the coming hours. Catastrophic flooding continues across Houston, with the western and northwestern parts of the metro area, from Katy to Tomball to The Woodlands, being hammered this evening. Do not leave your safe place tonight. Driving is extremely hazardous, especially after dark. Please do not call 911 unless you are in a life-threatening situation. Ominously, two of the region’s key flood mitigation tools, the Addicks and Barker reservoirs, are already so nearly full that they must release controlled amounts of water into Buffalo Bayou. This is going to be another long, excruciating night for a rain-soaked region that needs nothing so desperately as a week of hot, sunny August weather. I’m in the western part of Houston. I still have electricity for my house—but if this rain band is as bad as you say, that may change. I’ve been hearing that CenterPoint energy has suspended all repair operations and sent employees home even as +80K customers remain without power, due to navigation issues. I said suspended, Eric. As in not doing any. What can you tell me about this? That’s not true. CenterPoint has not suspended repair operations. We have friends staying with us, and he’s a lineman. He’s been working the last two days, and he’s not coming back tonight because they’re going to work all night, rest for a couple of hours, and work all of tomorrow. We’re not actually sure when he’ll be back, because he’s going to be working. According to their website, they’re not going into places that are unreachable due to flood waters. But they are definitely still working. Update: The linemen are not working through the night because it’s dark and too dangerous to move around. But they’re working as soon as it’s morning. Thank Heather, and thanks to Centerpoint and the lineman you’re hosting. Like you folks that “heard” the city was going to shut the water off at 1 pm today. Here’s an idea for Paul Robison and others… Log off Facebook. Thanks for the info, Heather. Thank your friend for all of us! He is one of the unsung heroes of this disaster and probably many others! And thieves might sneak up on me and steal my CenterPoint equipment. Dang varmints! Thanks, Eric. You guys are doing all of us a great service. Please take care of yourself and your family. Is that building “nearly stationary mass” likely to move at all in the next 12 hours ? Thank you, Eric. I pray you and your family are doing ok thru all of this as well. We really do not need more water in the SE metro area. Hopefully the rain will be more reasonable. Still waiting for one end of the road to drain. Drain is not plugged, the area it drains to already has too much water. Stay safe everyone. Will we see an increase or decrease of tornado activity tonight? Specially where you mention the hardest hit is pre midnight hours. Thank u so very much for all your dedication and hard work over the last few days! Hey Eric, how many more inches do you predict for us in Katy before we see any lull that might let some of it drain away? Any idea what the ramifications of releasing more water into Buffalo Bayou will be? Like, how much further beyond its banks this will push it? Thank you for the continued updates and information! Check out KHOU11 we know we are loyal to space city weather but just in case they were streaming the conference live, due to the fact that the Buffalo Bayou is already overflowing thousands will be affected. I hear that SJRA will open the dam on lake Conroe. What will be the effects downstream for residents near the San Jacinto? Will the water pool on lake Houston? Thank you so much for your hard work guys. Your clear information is such a relief during all this. Is it going to rain in Clearlake, SE Houston area tonight again? We cannot see the map they are using to show the flooding from Barker. Can you post it please! We need to know if we need to leave tomorrow. Try Channel 2 and Channel 13 sites. They should be up there, too. 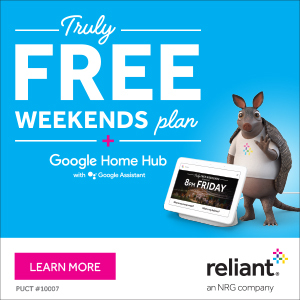 According to the statements on the TV announcement (have forgotten which channel I was on, ABC13 I think), the TV station was planning to post the maps on their website. I would expect all the major stations would post it. I thought they also mentioned something about them being posted on the Harris County Flood Control District website (https://www.hcfcd.org/), but I just looked and did not find them – that does not mean they are not there. Conservative choice is to pack up. How much estimated rain tonight for Cypress? The Addicks Dam is at I-10 and Eldridge and the Barker Dam (or one of them) is at Highway 6 and Memorial. However, it seems that you’re interpreting this as being the northern end of Addicks ‘Reservoir’ and both ends of Barker ‘Reservoir’. Is this a misprint on USACE’s part? Or a misunderstanding on my part? Thanks for the common sense approach. Not all BS you get from local WX experts that tell us to run to basement every time they thing they have saw rotation in some cgi. I’d bring the next shipment of beer to SCW HQ for you guys tonight but I’m told not to drive. God bless you both for your tireless assistance. Maybe we should take up a selection to send you guys and your families on vacation after this season is over. Yes! Great idea. I would love to contribute to a fund for these guys! So grateful for them! How long is it supposed to rain at this rate tonight?! I used to complain all day, every day, about Houston hot weather. Why is it so hot? Why do I sweat instantly the minute I leave my home? Why do I need to blast A/C everywhere? Oh, how I regret those words. I want to be in a desert so badly. Or at least, a very hot (and humid!) summer sunny day. Stay safe everyone! There was a great Hitchcock Presents story – just like that! Thank you for update My sister lives near Hobby Airport. With these resovior releases, what should I expect in the Cypress area? Thank you for these forcasts. We live in Beaumont and wait with baited breath for your post. Great Job! How much rain expected for Cypress overnight tonight? 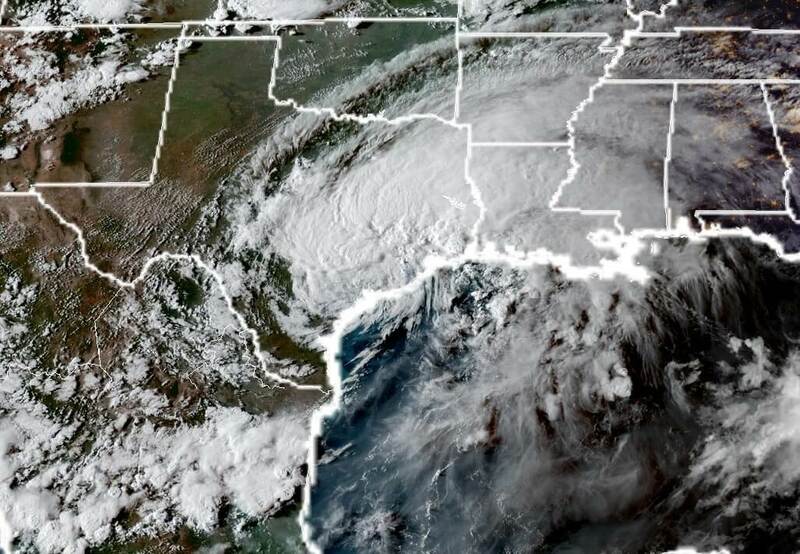 news reports show the storm returning to the gulf and making landfall again through Houston on Tuesday. Is this true? The 10pm forecast pushed it more to the east so there is still uncertainty. The European model looks like it is pushing landfall to the TX/LA border. I would think that would be better news for us and give us the “cleaner” side of the storm on the west. Thank you for your reporting and analysis. Awesome and informative updates as I try to keep up on things at home in Hou during the flooding while visiting Calgary for a wedding. Thanks for the useful info! Adding to the many thank yous. Your posts have been so helpful. At 9:40 p.m. here in Braeburn Terrace we are having torrential rain and are waiting for the water to come back in the house. My daughter lives on Misty Island Ct off of Peak Rd. They are planning on moving to the second story of their house for tonight. Should they evacuate tonight? Why do these reservoirs need to release more water into the systems that are already desperately overwhelmed and people are dying? This is so crazy!! Jen, the reservoirs are full of water and the fear is they will fail and all the water would spill out at once which would be catastrophic. They are trying to prevent this. The reservoirs are already maxed out and if they don’t do a *controlled* release, there’s potential for levee destruction and a full-on release of greater proportions, causing much greater destruction. They’re doing a controlled release so that the dams don’t spill over and fail altogether, which would be far worse for the region. Chron.com has a really informative article about these reservoirs and badly needed upgrades that are in process. Because if they don’t take some pressure off the dams, they will burst and cause a wall of water that doesn’t fill houses with water but rather carries entire neighborhoods clean away. To prevent a total dam failure. That would cause a catastrophic loss of life. Will the old earthen damhold? Remember when they wanted to build that big sea wall south of Houston? This looks like one of the times that might not have been a great idea. I’ve been watching the Coast Guard news report. 19 helicopters in the air. I have ever seen this big of a response. people, that means only 0.6 known people per 1000 may have found themselves in a serious position so far. week are still to be found. in situations not covered by the Normal Now. My prayers are with my people. I can remember seeing a response like this, during Sandy and Katrina. Those are some sobering precedences. The Addicks reservoir is going to be controlled released tonight beginning around 2am estimate time, depending on the rain we get. The water will go from the Addicks reservoir through downtown to Buffalo bayou so many no thousands will be affected. They plan to do the same with Barker Reservoir later on in the week maybe 24/48 hours afterwards since Addicks fills quicker. I’m not sure if this is all legit but it’s what I got from the conference with the flood control. Thousands will be affected and this is the first time we have done this. God be with us all, we are praying for miracles. Lord Hear our prayers. Thank you for your highly informative and geographically specific posts. Invaluable. 2) Yet the weather forecast now is for 50 inches of rain. So why is the news media not asking the City Council and Mayor if they misled the people? The news debate of whether the mayor should have ordered an evacuation is a red herring — if people see a hurricane coming and don’t move out of the way then that’s their responsibility, not the mayor’s. But people deserve to hear the facts and the full truth about a looming danger so that they can decide how to respond, , not to be manipulated with false info. The 50 inches of rain is not conclusive proof that city government engaged in a conspiracy to manipulate public opinion. But why don’t residents of Houston want to know if that did –or did not — happen? If you followed the NOAA updates of Harvey, they kept increasing their estimates of maximum rainfall over the lasr few days as well. I don’t think this was a conspiracy. So your theory is that Houston was able to manipulate international weather services? You obviously weren’t watching the Houston stations. They were mentioning the possibility of 50 inches, as was the NWS. It wasn’t a high probability, but it was often mentioned. Conspiracy theories are most often just stupid. Don’t listen to the voices in your head, they will lie to you. Right now people are trying to stay ALIVE and dry. I have many friends who have evacuated Houston for years (including Rita). Some even posted pictures of that evacuation as the reason they were not leaving this time. They remember long, hot evacuations for no reason. It is also important to know that the greater Houston area is roughly the size of Connecticut (yes, the state) and has a larger population than 9 states. It is MASSIVE. To evacuate that many people is not truly possible. I have at least three friends that posted today in their feeds looking for someone to rescue a person they know. There is really no GOOD way to handle an over built city. I grew up in Houston and now live in San Antonio. Our whole city feels for our neighbors down I-10 and know it could have been us (we have 20 foot water markers around here too). There will be LOTS of lessons to learn from this (just like every other disaster) but right now lets focus on those unsung heroes who are literally out in their canoes rescuing people off of their roof tops today. Would you have truly believed 50 inches of rain?? You do realize that you can evacuate at any time you feel the need to do so, don’t you? After how this city fared during it’s reaction to Rita possibly hitting it dead on, I don’t blame officials for holding off from telling all citizens to evacuate. As devastating as all of this has been so far, there have been few deaths to report. And I would venture to say that there are more homes that have not flooded than ones that have. I think the right decision was made to tell folks to stay put. Have you read back through the posts on this site, which is generally regarded as reasonable and open handed about what the data was showing? NO ONE predicted or expected this much rain. It was expected to potentially be a big flood event, a rival to prior *known* floods (Tax Day, Alicia, Ike), and people prepared accordingly. But this is unprecedented — and the death toll would have been astronomical if evacuation had been called, because not everyone could have gotten out in time. The people of Houston and the surrounding areas are focused on surviving at the moment. I’m amazed I have to state this directly given both the news coverage and comments on this page. Perhaps you could put your tinfoil hat on and go sit in a corner somewhere while the rest of us focus on getting our community through this catastrophe? I live at the top of the Langham Creek watershed that feeds into Addicks. I have a 5 gallon bucket sitting on my back porch that I emptied earlier today when it stopped raining. It was full from last night. It is almost full again since this afternoon. I have no idea how addicks is going to hold all this water. Hi Eric – Thanks for your reasoned reporting – because everyone’s blood pressure goes up watching the TV. My neighbors in the Ashore area, (Briar Forest/Dairy Ashford area – not far from the Robin Trail, are worried that we will have to evacuate becasue of the releases. But we are at 79 feet – the Bayou has crested at 73.33 – our street has filled and drained a couple of times now but nothing over the curb. Thoughts? Are we high enough? Thanks again, again and again….just one more question-any hope it will EVER end,and if it will-WHEN???? It is possible to drive out of Houston still? If it is, how can I find the best possible route and check for their condition. It seems like the Corps is more concerned about the neighborhoods IN the reservoirs than anything on Buffalo Bayou, and that is freaking me out. They are not evacuating or notifying anyone on the bayou downstream. How big is this pulse going to be? It seems like the answer is a big shrug. How will the release of water from Addicks and Barker Reservoirs affect the area near Buffalo Bayou? Follow up question to above: Why is no one holding KHOU news anchor Len Cannon accountable for publicly and arrogantly attacking the social media Harvey warnings as “irresponsible” and claiming KHOU had debunked them? As far as I can see, all KHOU did was let some officials make vague responses that dodged the question. Amusing considering Lou’s news room is reportedly underwater at the moment. It is simply not possible to evacuate 6 million people via 3 routes in two days. That was all the warning anyone had. If the city/county/state officials had ordered an evacuation, thousands would have died. Stuck on the road, with no way to exit, no way to get EMS, gas, or anything else, will be lethal to many. It would take more than a week to evacuate Harris County. The voices in your head are lying to you again. 1)Oh, claptrap. The few deaths from Rita could have occurred just as well in Houston — it is just as hot in a house without ac as in a car and traffic deaths occur in Houston all the time. And the massive jams in Rita occurred because your government was too incompetent to turn on contraflow. 2) You people keep putting up a strawman argument instead of addressing the issue. Defending the incompetence of central planning by a small elite instead of giving people the chance to help themselves. 2) Was Contraflow turned on this time for Interstate 10 (East and West) and I-45? Why not? Even if only 3 million chose to leave wouldn’t that greatly reduced the heavy burden on first responders and free them to help those who need it? Try using reason instead of reciting the City Council’s party line. Thankfully, few problems inside The Woodlands, except for a few areas near Spring Creek. A local message went out to people there that they might have to evacuate. Some road flooding along 1488 and I-45 feeders. Rayford Road is shut due to high water between Richards Road west to I-45.